The more users able to access your Microsoft SQL Server 2008 R2, the more your data can be transformed from numbers and names in a document to powerful, concrete business solutions. Microsoft SQL Server 2008 R2 has new tools that get the most from your data, while still keeping it organized, secure, and backed up in case of emergency. With User CAL licenses for your server, more employees get all those benefits and can share their insights to help your business grow. The Microsoft SQL Server is a relational database management system that provides storage, organization, analysis, and reporting tools for all a business’ data. Moreover, the SQL Server includes business intelligence features that uncover new and powerful insights found in the data that can then be shared across a business to develop new solutions. What Is a CAL License? CAL is short for client access license. It provides access to the Microsoft SQL Server. A CAL for 2008 R2 can be used by any edition, but it can only be used to access one server. CALs come in two different forms: device and user. 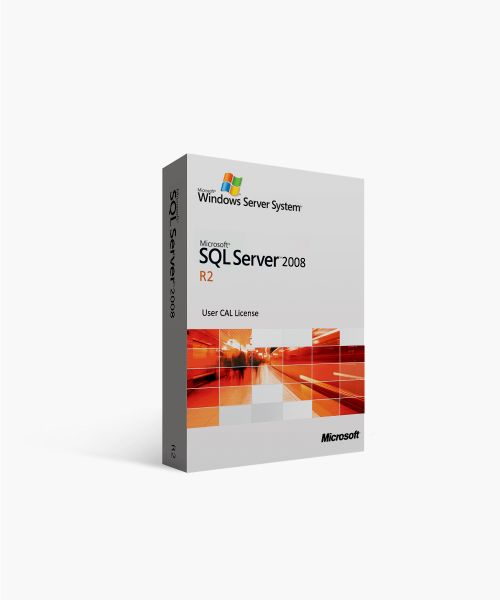 A User CAL provides access to your Microsoft SQL Server 2008 R2 for one licensed user. The user can connect through any device. This product is a User CAL for an already installed copy of Microsoft SQL Server 2008 R2. The server itself is not included. If you would like to purchase Microsoft SQL Server 2008 R2, SoftwareKeep sells it for a guaranteed low price elsewhere on the site. Microsoft SQL Server 2008 R2 has a rich new set of features that improve analysis and reporting for all your business intelligence needs. There are also improved administrative features and hardware capabilities to get the most out of your server. More Processor Core Capabilities—Enterprise and Datacenter editions allow for vastly more scalability and better overall system performance by making it possible to have up to 64 processors and 256 cores. This is a major jump from previous editions and even from other versions of the same edition, such as Standard, which only allows a maximum of 4 processors. Easy to use business intelligence wit PowerPivot for Excel—Increasingly, the entire purpose of the SQL Server is to get the best business intelligence out of a business’ data. That just got a lot easier to accomplish with PowerPivot for Excel. With PowerPivot, you get incredible analysis in Excel that is combined with built-in compression so that results arrive almost instantaneously, even when you are working with millions of rows of data. Data isn’t limited to a single Excel document, either. PowerPivot can reach beyond Excel to bring in data from different databases and even from different data sources, such as Oracle, Teradata, and even certain reports. PowerPivot for Excel is available in Enterprise and Datacenter editions. Back up and share business-critical documents with PowerPivot for SharePoint—PowerPivot doesn’t just provide enhancements to Excel, it also brings a lot to SharePoint as well. With PowerPivot, you can place business-critical Excel documents on SharePoint where you can share them and manage them. Most crucially of all, you can keep them saved and backed up in case of accidental deletion. In the past, these documents were rarely organized or backed up and if they were deleted or corrupted, the data was simply lost and unrecoverable. PowerPivot for SharePoint provides a way of safe guarding all that important data. As with PowerPivot for Excel, it is only available in the Enterprise and Datacenter editions. Improved multiserver management—SQL Server Management Studio already provided far better administrator management of the SQL Server in earlier editions, but now, in the 2008 R2 edition, it takes a step further in making it easier to run multiple servers. New wizards and dashboards provide new capabilities while also allowing administrators to be walked through all the steps required. With Utility Explorer, you can manage up to 25 SQL Server instances at once. This feature, like PowerPivot, is only available for Enterprise and Datacenter editions. Unify data with Master Data Services—The problem for medium and large (and sometimes even small) businesses is that data often gets entered multiple times in multiple formats and in multiple forms. This can make it hard to get the data to communicate together. Master Data Services provides all the solutions for this dilemma. It creates a master definition for your data and then converts all the different formats and forms to that definition. It also sends out notification when others violate the data rules with new data. This ensures all your data all over the server is consistent. Master Data Services are available in Enterprise and Datacenter editions. Real-time data with StreamInsight—Some businesses really need data as close to real time as possible. Until now, that was hard to accomplish, but StreamInsight (available in the Datacenter edition) now gives it to you. Processing thousands of events per second, it can provide up-to-date data for industries that are tied to the stock market or other rapidly changing information. New and easier reporting with Report Builder 3.0—Data insights aren’t worth much if they can’t be reported. Report Builder 3.0 provides new levels of use to make sure data insights are easy to understand for everyone. It includes the Office Ribbon for easy to find features. Now, for the first time, it integrates geospatial data and a new map wizard to help translate it to the report. Report parts can also be created and saved for later use in other reports. There are no specific requirements for the devices used with User CALs that access the server. However, the more up-to-date the device and the more compatible the operating system, the easier it is for users to enjoy all the features found on the server. At SoftwareKeep, you can get User CAL Licenses for Microsoft SQL Server 2008 R2 at the guaranteed lowest price. We also guarantee our experts have all the answers you need to your questions about the server and CALs. Contact them any time either on-site or by call us at (877) 315-1713. $211.19 | In Stock Want it Now? Order and receive your download instantly.